Untiring idealism about the natural world combined with strategic brilliance and ingenuity are on vivid display in Spencer Beebe's Cache. 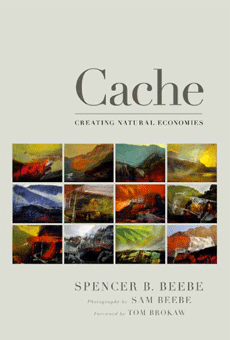 The first thing that strikes one about Spencer Beebe's Cache: Creating Natural Economies is that it is neither fish nor fowl, written by a man who has a clear passion for both. It's the kind of book that, almost by design, will drive compartmentalized minds to distraction — what shelf should it go on? Part memoir, part manifesto, Cache comes closest to being an old-fashioned apologia — the personal history of how one man arrived at his conviction — from a 35-year career in conservation. What is clear from both the structure and strategy of the book is that Beebe cannot separate theory from practice, life lessons from work lessons. For the most part, Beebe embeds his lessons in on-the-ground stories, leaving readers to draw their own conclusions. Even when talking about the principles he feels are indispensable to environmental and economic health, he backs his assertions with facts and examples from his life-long experience as a lover and steward of natural places. He is nothing if not a pragmatist; if something doesn't work, he'll keep experimenting until he finds something that does. Beebe's central message, in fact, is that both traditional economics and traditional conservation have failed to deliver "reliable prosperity." His central conviction is that neither will succeed in doing so until they are grounded in principles found in nature. Cache is the story both of how he arrived at this conviction and of how it operates in the lives of real people grappling with real problems in the places they call home. Nature has no impermeable surfaces; resources flow through ecosystems and are shared, stored, restored, and recycled constantly. The interesting places in nature are eco-centers where large amounts of food or water or other scarce resources are relatively abundant, such as grizzly bears, gulls, and ravens feeding on spawning salmon. And ecotones, the interface of distinct habitat types or landscapes where species mix: the forest edge of a meadow, stream banks, an estuary or watering hole in dry country. That is where the action and interaction is; where individuals meet, mate, reproduce, eat and are eaten; where populations evolve; where both positive and negative feedback loops occur and some are tossed from the gene pool. So we set about designing open space, large hallways, an atrium, an open rooftop around, naturally, a fireplace, a wide loading dock where people could sit outside, conference rooms of every possible size and configuration, mezzanines for hiding, and a public trail connecting them all, winding from the first and second floors up outside stairs to the roof-top terrace…. The Jean Vollum Natural Capital Center is a living, breathing ecosystem that we hope gives new meaning to "living building," a model for urban living an — get this — a marketplace for the goods, services, and ideas of an emerging conservation economy. 4. Creation Myth: High Drama in D.C.
10. The First Environmental Bank: A New Take on "Green"
Spencer Beebe is a fourth-generation Portlander who spent 13 years with The Nature Conservancy before helping found Conservation International in 1987. In 1991, he founded Ecotrust to focus his work on the rain forests of home. He serves on the boards of Tamástslikt Cultural Institute and Walsh Construction Company. Spencer is a member of the Ecotrust and Ecotrust Canada boards of directors. By Spencer B. Beebe. Edited by Gary Miranda. Photographs by Sam Beebe.